In 1980 the St. Tammany Parish Planning Commission prepared a document describing many of the interesting architectural structures in central Abita Springs. 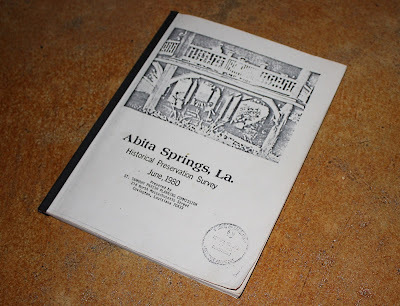 The booklet was called the "Abita Springs Historical Preservation Survey" with Keith J. Villere noted as the author. Part of the effort included several pages containing an extensive history of Abita Springs and its community characteristics. To read a portion of that commentary, CLICK HERE for a PDF file or click on the images below to enlarge the view.